If the wind blows parallel to the coast in the southern hemisphere (such as along the coast of Peru, where the wind blows North), then Ekman transport can produce a net movement of surface water 90° to the left. This may result in coastal upwelling. If the wind blows parallel to the coast in the northern hemisphere (such as the coast of California, where the wind blows South), then Ekman transport can produce a net movement of surface water 90° to the right. This may result in coastal upwelling. Wind is the flow of gases on a large scale. On the surface of the Earth, wind consists of the bulk movement of air. In outer space, solar wind is the movement of gases or charged particles from the Sun through space, while planetary wind is the outgassing of light chemical elements from a planet's atmosphere into space. Winds are commonly classified by their spatial scale, their speed, the types of forces that cause them, the regions in which they occur, and their effect. The strongest observed winds on a planet in the Solar System occur on Neptune and Saturn. Winds have various aspects, an important one being its velocity ; another the density of the gas involved; another its energy content or wind energy. Wind is also a great source of transportation for seeds and small birds; with time things can travel thousands of miles in the wind. Ekman transport, part of Ekman motion theory first investigated in 1902 by Vagn Walfrid Ekman, refers to the wind-driven net transport of the surface layer of a fluid that, due to the Coriolis effect, occurs at 90° to the direction of the surface wind. This phenomenon was first noted by Fridtjof Nansen, who recorded that ice transport appeared to occur at an angle to the wind direction during his Arctic expedition during the 1890s. 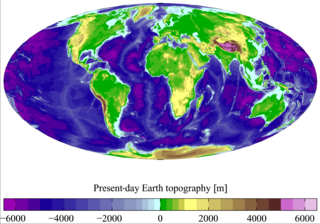 The direction of transport is dependent on the hemisphere: in the northern hemisphere, transport occurs at 90° clockwise from wind direction, while in the southern hemisphere it occurs at a 90° counterclockwise. The major upwellings in the ocean are associated with the divergence of currents that bring deeper, colder, nutrient rich waters to the surface. There are at least five types of upwelling: coastal upwelling, large-scale wind-driven upwelling in the ocean interior, upwelling associated with eddies, topographically-associated upwelling, and broad-diffusive upwelling in the ocean interior. A phosphate is a chemical derivative of phosphoric acid. The phosphate ion is an inorganic chemical, the conjugate base that can form many different salts. In organic chemistry, a phosphate, or organophosphate, is an ester of phosphoric acid. Of the various phosphoric acids and phosphates, organic phosphates are important in biochemistry and biogeochemistry, and inorganic phosphates are mined to obtain phosphorus for use in agriculture and industry. At elevated temperatures in the solid state, phosphates can condense to form pyrophosphates. Coastal upwelling exists year-round in some regions, known as major coastal upwelling systems, and only in certain months of the year in other regions, known as seasonal coastal upwelling systems. Many of these upwelling systems are associated with a relatively high carbon productivity and hence are classified as Large Marine Ecosystems  . 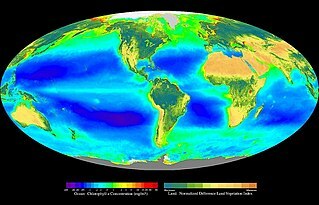 Worldwide, there are five major coastal currents associated with upwelling areas: the Canary Current (off Northwest Africa), the Benguela Current (off southern Africa), the California Current (off California and Oregon), the Humboldt Current (off Peru and Chile), and the Somali Current (off Somalia and Oman). All of these currents support major fisheries. The four major eastern boundary currents in which coastal upwelling primarily occurs are the Canary Current, Benguela Current, California Current, and Humboldt Current. The Benguela Current is the eastern boundary of the South Atlantic subtropical gyre and can be divided into a northern and southern sub-system with upwelling occurring in both areas. The subsystems are divided by an area of permanent upwelling off of Luderitz, which is the strongest upwelling zone in the world. 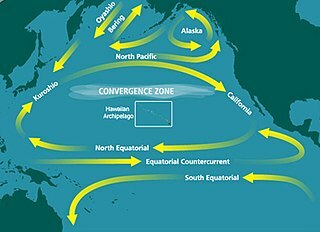 The California Current System (CCS) is an eastern boundary current of the North Pacific that is also characterized by a north and south split. The split in this system occurs at Point Conception, California due to weak upwelling in the South and strong upwelling in the north. The Canary Current is an eastern boundary current of the North Atlantic Gyre and is also separated due to the presence of the Canary Islands. Finally, the Humboldt Current or the Peru Current flows west along the coast of South America from Peru to Chile and extends up to 1,000 kilometers offshore. These four eastern boundary currents comprise the majority of coastal upwelling zones in the oceans. Large-scale upwelling is also found in the Southern Ocean. Here, strong westerly (eastward) winds blow around Antarctica, driving a significant flow of water northwards. This is actually a type of coastal upwelling. Since there are no continents in a band of open latitudes between South America and the tip of the Antarctic Peninsula, some of this water is drawn up from great depths. In many numerical models and observational syntheses, the Southern Ocean upwelling represents the primary means by which deep dense water is brought to the surface. In some regions of Antarctica, wind-driven upwelling near the coast pulls relatively warm Circumpolar deep water onto the continental shelf, where it can enhance ice shelf melt and influence ice sheet stability. Shallower, wind-driven upwelling is also found in off the west coasts of North and South America, northwest and southwest Africa, and southwest and south Australia, all associated with oceanic subtropical high pressure circulations (see coastal upwelling above). Upwelling intensity depends on wind strength and seasonal variability, as well as the vertical structure of the water, variations in the bottom bathymetry, and instabilities in the currents. Downwelling is the process of accumulation and sinking of higher density material beneath lower density material, such as cold or saline water beneath warmer or fresher water or cold air beneath warm air. It is the sinking limb of a convection cell. Upwelling is the opposite process and together these two forces are responsible in the oceans for the thermohaline circulation. The sinking of cold lithosphere at subduction zones is another example of downwelling in plate tectonics. The Benguela Current is the broad, northward flowing ocean current that forms the eastern portion of the South Atlantic Ocean gyre. The current extends from roughly Cape Point in the south, to the position of the Angola-Benguela front in the north, at around 16°S. The current is driven by the prevailing south easterly trade winds. Inshore of the Benguela Current proper, the south easterly winds drive coastal upwelling, forming the Benguela Upwelling System. The cold, nutrient rich waters that upwell from around 200–300 m depth in turn fuel high rates of phytoplankton growth, and sustain the productive Benguela ecosystem. The Humboldt Current, also called the Peru Current, is a cold, low-salinity ocean current that flows north along the western coast of South America. It is an eastern boundary current flowing in the direction of the equator, and extends 500–1,000 km (310–620 mi) offshore. The Humboldt Current is named after the Prussian naturalist Alexander von Humboldt. In 1846, von Humboldt reported measurements of the cold-water current in his book Cosmos. The Canary Current is a wind-driven surface current that is part of the North Atlantic Gyre. This eastern boundary current branches south from the North Atlantic Current and flows southwest about as far as Senegal where it turns west and later joins the Atlantic North Equatorial Current. The current is named after the Canary Islands. The archipelago partially blocks the flow of the Canary Current. 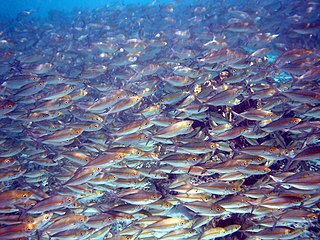 Forage fish, also called prey fish or bait fish, are small pelagic fish which are preyed on by larger predators for food. Predators include other larger fish, seabirds and marine mammals. Typical ocean forage fish feed near the base of the food chain on plankton, often by filter feeding. They include particularly fishes of the family Clupeidae, but also other small fish, including halfbeaks, silversides, smelt such as capelin, and the goldband fusiliers pictured on the right. The Somali Current is an ocean boundary current that runs along the coast of Somalia and Oman in the Western Indian Ocean and is analogous to the Gulf Stream in the Atlantic Ocean. This current is heavily influenced by the monsoons and is the only major upwelling system that occurs on a western boundary of an ocean. The water that is upwelled by the current merges with another upwelling system, creating one of the most productive ecosystems in the ocean. The Great South Australian Coastal Upwelling System is a seasonal upwelling system in the eastern Great Australian Bight, extending from Ceduna, South Australia, to Portland, Victoria, over a distance of about 800 kilometres (500 mi). Upwelling events occur in the austral summer when seasonal winds blow from the southeast. These winds blow parallel to the shoreline at certain areas of the coast, which forces coastal waters offshore via Ekman transport and draws up cold, nutrient-rich waters from the ocean floor. The Southwest Madagascar Coastal Current (SMACC) is a warm poleward ocean current flowing in the south-west of Madagascar. Heceta Bank is a rocky bank located 55 kilometers (km) off the Oregon coast near Florence, centered on approximately 44°N, 125°W, and is roughly 29 km long and upwards of 13 km wide. Heceta Bank is an area of ecological and oceanographic importance. The unique bathymetric features and seasonal circulation within the bank provides habitat for a diversity of economically-important fish species. 1 2 3 Anderson DM, Prell WL. (1993). A 300 KYR record of upwelling off Oman during the late quaternary: evidence of the Asian southwest monsoon. Paleoceanography, 8(2): 193-208. ↑ Sarhan T, Lafuente JG, Vargas M, Vargas JM, Plaza F. (1999). Upwelling mechanisms in the northwestern Alboran Sea. Journal of Marine Systems, 23: 317-331. 1 2 Bakun A. (1990). Global climate change and intensification of coastal ocean upwelling. Science, 247: 198-201. ↑ Chelton DB, Schlax MG, Freilich MH, Milliff RF. (2004). Satellite measurements reveal persistent small-scale features in ocean winds. Science, 303:978-983. ↑ Bakun A, Nelson CS. (1991). The seasonal cycle of wind-stress curl in subtropical eastern boundary current regions. Journal of Physical Oceanography, 21: 1815-1834. ↑ Brodeur RD, Ware DM. (2007). Long-term variability in zooplankton biomass in the subarctic Pacific ocean. Fisheries Oceanography, 1(1): 32-38. 1 2 3 4 5 Cury P, Bakun A, Crawford RJM, Jarre A, Quinones RA, Shannon LJ, Verheye HM. (2000). Small pelagics in upwelling systems: patterns of interaction and structural changes in “wasp-waist” ecosystems. ICES Journal of Marine Science, 57:603-618. ↑ Greene, Chad A.; Blankenship, Donald D.; Gwyther, David E.; Silvano, Alessandro; Wijk, Esmee van (2017-11-01). "Wind causes Totten Ice Shelf melt and acceleration". Science Advances. 3 (11): e1701681. doi:10.1126/sciadv.1701681. ISSN 2375-2548. ↑ US Research project, NSF and Oregon State University Archived August 4, 2009, at the Wayback Machine . ↑ Rasmussen EM, Carpenter TH. (1982). Variations in tropical sea surface temperature and surface wind fields associated with the outer Oscillation/El Nino. Monthly Weather Review, 110: 354-384.